The Cagiva name is pretty much in the doldrums these days and a new Mito 500 seems to be the only ray of hope for the once-great Italian company. But back in the early-1990s, things were very different – Cagiva were actually going head to head against the Japanese in the 500cc class, in motorcycle grand prix racing. With Americans John Kocinski and four-time 500cc world champ Eddie Lawson riding Cagiva 500s – officially called the Cagiva C593 – the Italian machines got a few wins and podium finishes, which was not too bad given the fact that Cagiva were still a tiny little operation compared with the might of the Japanese companies. Cagiva were present in 500cc GP racing throughout the 1980s, with riders like Virginio Ferrari, Jon Ekerold, Raymond Roche and Randy Mamola (who rode his Cagiva to third place in the 1988 Belgian GP) piloting their machines. 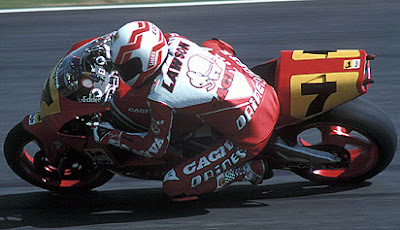 But the beautiful Italian bikes only became seriously competitive in the early-90s, with Kocinski and Lawson on board. Eddie Lawson, 500cc world champ in 1984, 86, 88 and 89, won the 1992 Hungarian 500cc GP aboard his Cagiva, and got a Ferrari Testarossa from the Castiglioni brothers for his efforts! Lawson, in fact, won the Hungarian GP in 1992 on his Cagiva 500, and got a Ferrari Testarossa from Cagiva for his efforts. Later, Kocinski won the 1993 USGP at Laguna Seca. The Cagiva C593 packed a ‘big bang’ V4, which made 175 horsepower at 12,500rpm – a bit down on the Honda NSR500 of those days, but roughly equal to the Suzuki RGV500 and the Yamaha YZR500. The 130-kilo C593 was fitted with Michelin tyres, carbon brake discs, lots of carbonfibre bits and it even had an electronic, clutchless gearshift system back then. Cagiva also ran semi-active Showa suspension for some time, but later switched to conventional Ohlins units. How Often to Change Engine Oil In Bikes? Gear Box problem in my pulsar! !